This diverse and fast-paced course provides professional training in areas of motion graphics, web design, animation, compositing, 3D graphics, visual effects. Students learn how to research and generate ideas and gain the design skills needed to produce highend, mouth-watering graphics. We provide a rock solid foundation in all the skills required to work as part of a team, or to specialise in the area that best suits a student’s skills. Year 2 focuses on advanced motion graphics, 3D character animation, 3D cinematography and creating professional responsive websites. Digital Media at CSN is a special course because the qualification you achieve is an internationally recognised BTEC Higher National Diploma. This is part of the UK framework where it is equivalent in value to a Foundation Higher Education. As well as being eligible to apply to Irish IT colleges for entry into second year, Digital Media graduates can apply to a range of UK colleges and universities to do a one year top-up to achieve an Honours Degree. In that way this course can be viewed as the first two years of a three year Higher Education. On completing this course, if you don’t wish to take the 3rd level route, you are still very well equipped to go directly into the workplace. As well as being eligible to apply to Irish IT colleges for entry into second year, Digital Media graduates can apply to a range of UK colleges and universities to do a one year top-up to achieve an Honours Degree. In that way this course can be viewed as the first two years of a three year degree. On completing this course, if you don’t wish to take the 3rd level route, you are still very well equipped to go directly into the workplace. 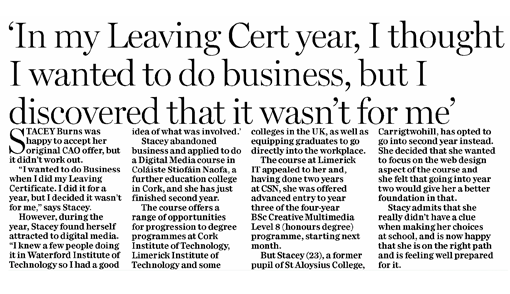 Leaving Certificate or equivalent. All applicants are interviewed with a portfolio of work and places are awarded on suitability. Year One covers a broad range of skills in computer graphics, video, compositing, animation and web design. Year Two focuses on 3D modelling, visual effects and animation techniques. Students also learn to produce websites with advanced functionality such as CMSs (Content Management Systems) and learn how to prepare for the latest developments in web technology beyond HTML5 and CSS3. Graduates have an excellent and adaptable skills set. Recent graduates are employed in web design, e-learning, 3D animation, architectural visualisation, film post-production and video-game graphics. They work for a broad range of companies such as Wavebreak Media, Framestore, Factory Media, M-I-E, SceneStealer, Jellyfish, Doodle Creative, Twitter, Red Man Media, Hopkins Communications and many more. NOTE: for a detailed list of where our Digital Media Graduates are working now, please explore our 'Highlights' section below. CIT: BA (Hons) in Creative Digital Media (CR112). Laura Clark, Digital Media Year 1. A 28 second animation of 'The Name of the Wind' by Patrick Rothfuss. Drawings done in Adobe Photoshop and animated in Adobe Animate. Audio from the UK audiobook on audible.co.uk read by Rupert Degas. The Name of the Wind Animation from Laura Clarke on Vimeo. In Year 1 the Digital Media students work as a group to design and build an interactive game. They work together right from the initial concept, through designing, building, animating, programming, and user testing. It's a great way to learn a broad range of techniques to a high level, particularly project management, interactive principles and scripting for games. This project below is a good example; click on it to play the game..
(Note: Currently this version won't play on iPhones and iPads, but we'll upload the Apple compatible version too). Previous graduates of Digital Media such as Iva Trajkovic (See her IMDB page here) have gone onto successful careers in visual effects and compositing for film. IvaVfx Showreel from ivavfx on Vimeo. 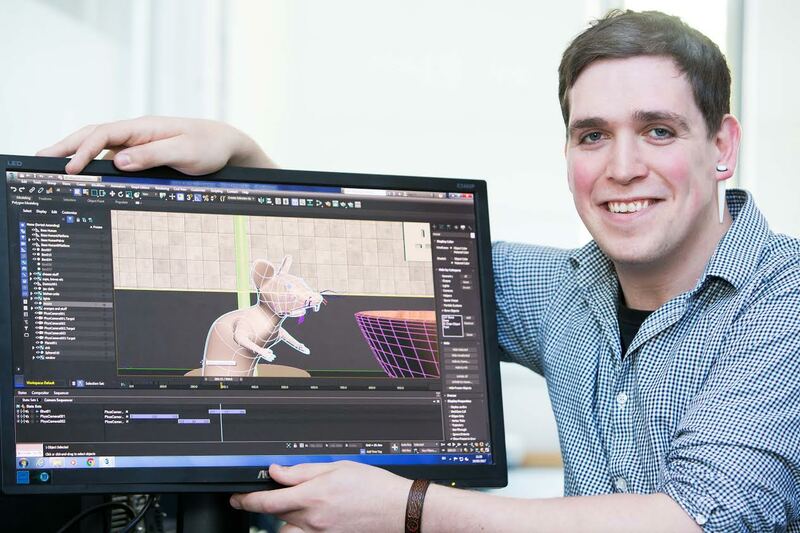 A number of our graduates have excelled in 3D modelling and animation including Zoltan Kovary and Kevin O'Shea. In the first term of Year One, Digital Media students complete a ten second vector-based animation on a theme of their choice. Here are two examples. I would not be in my position if it wasn't for the Digital Media course at CSN. I owe a lot to this course and the teachers for helping me start my journey into the industry, without this course I would have not gotten my degree or a job. Lecturer on the Digital Animation and Creative Multimedia course in LIT Clonmel (MA Digital Effects at NCCA). 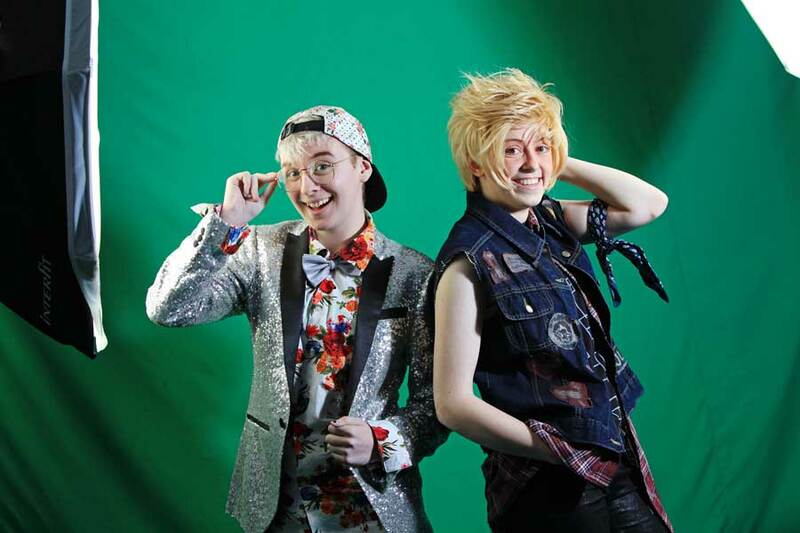 "The foundation and support offered to Digital Media students is fantastic; there is always help and resources for students who put in the work required to acquire good grades." I wouldn't have the job I have today if it wasn't for the Digital Media course at CSN. It gives you a fundamental knowledge that can be applied to all areas of digital media and a strong grounding in practical skills, software, and production. Thank you Andrea, John and Rupert! UX Designer at Xanadu Consultancy. Marketing & Design Dept., Eagle Consumables, New Zealand. The lecturers in CSN Digital Media are down to earth and very passionate about their roles, something that is so important to students. There was a wide range of classes available that gave the students a taste of each creative area. I have referred other people who are not sure of 3rd level colleges onto CSN. Web Designer & Developer Red Man Media in Dun Laoghaire, Co Dublin.www.redmanmedia.ie. Studying Digital Media at CSN was a really great experience. Iva was introduced to compositing and 3D as part of her BTEC HND using software like 3DS Max & Combustion. After CSN Iva went on to do a one-year BA top up course in Bournemouth. She was then accepted onto the prestigious MA in Digital Effects in Bournemouth University and from there landed a job with one of the world's top visual effects and post-production companies Framestore CFC after completing this course and advancing on to others. Gravity, World War Z , Frankenweenie, Dredd, Wrath of the Titans, Immortals , Harry Potter and the Deathly Hallows: Part 2, The Chronicles of Narnia: The Voyage of the Dawn Treader, Harry Potter and the Deathly Hallows: Part 1, Resident Evil: Afterlife, Clash of the Titans, Nanny McPhee Returns, Legends of Chima (Animated TV Series). www.jessocallaghan.com BA in Digital Media Design Brighton (University of Brighton one-year top up degree). UK National Media UK Award Design winner. Currently working as a Digital Designer for a HTML5 based online advertising company, Scenestealerhttp://scenestealer.tv . The CSN Digital Media course was amazing. Everyone who came over to Brighton (to do the University of Brighton one-year top up degree) from Cork was way more technically skilled than those who had done the first two years in Brighton. I learnt so much in those two years, what I learnt at CSN got me my degree; I wouldn't have done half as well without it." Currently completing a BSc (Honours) in Creative Multimedia at LIT. I really enjoyed my time at CSN. Unlike big universities, the class was nice and small, making it easier to be social with my whole class. Whenever we needed help with anything, the lecturers were more than happy to help out. I loved the content of the course, and while we weren't overloaded with work, we were given a good challenge. In relation to the course I'm currently studying (Creative Multimedia - BSc (Honours) (Level 8)), I had a good head start, thanks to what I learned in Digital Media. BA in Digital Media Design Brighton (University of Brighton one-year top up degree). I loved my time at CSN. If I could go back and do it again I would. I met a lot of different people who had gone through a lot of different courses in Digital Media and none of them were as comprehensive or as practically useful as this course. I thought the course was excellent with a great mix of software and theory that opens up a huge amount of options to everyone who graduates. I was very happy with what was taught to me. The CSN Digital Media course offers a very diverse and in-depth footing in the Digital Media world, more so than any other similar course as far as I can tell. I really appreciated the time being put in by the tutors to actually help you learn how to design effectively rather than just handing you the briefs which I've encountered in other media courses. I have CSN alone to thank for starting me on my career in Digital Media and there is no other course I would recommend to someone if they are ­looking to develop an interest in Digital Media and possibly make a career out of it! My experience studying Digital Media at CSN has been hugely beneficial; it allowed me to explore and develop my creative abilities. The teaching staff of the course I could not praise any higher! They were very clear and skilled at teaching the course in such a fun and exciting way. Graphic Designer with Hopkins Communications. It is the best course I have done. I found the lectures excellent and I loved the course and what we covered over the two years. Working in Film & TV Production. I really enjoyed my time at CSN and most certainly benefited from it. I would highly recommend this course to anybody with an interest in the media sector. Zoltan Kovary Editor and motion graphics artist, working in the film industry. Daria Grieco: Editorial manager at Amazon. * Note: Students with medical cards are exempt from paying the Dept. of Education & Skills fee. Currently completing a BSc (Honours) in Creative Multimedia at LIT. I really enjoyed my time at CSN. Unlike big universities, the class was nice and small, making it easier to be social with my whole class. Whenever we needed help with anything, the lecturers were more than happy to help out. I loved the content of the course, and while we weren't overloaded with work, we were given a good challenge. In relation to the course I'm currently studying (Creative Multimedia - BSc (Honours) (Level 8)), I had a good head start, thanks to what I learned in Digital Media. My background was in traditional Animation but I needed to update my skills in a digital world and the Digital Media course in CSN was the ideal platform to combine the two. The diversity of the modules in theory and practice opened up a wide range of possibilities of the direction my work could go in. I can’t thank the tutors enough for their guidance and encouragement and giving me the knowledge to use the software to further my career in areas I would have never explored. With a HND BTEC qualification in digital media I am now doing a top up degree year to gain my level 8. CSN is a fantastic further education college, offers great opportunities in a friendly atmosphere; I couldn’t recommend it highly enough. 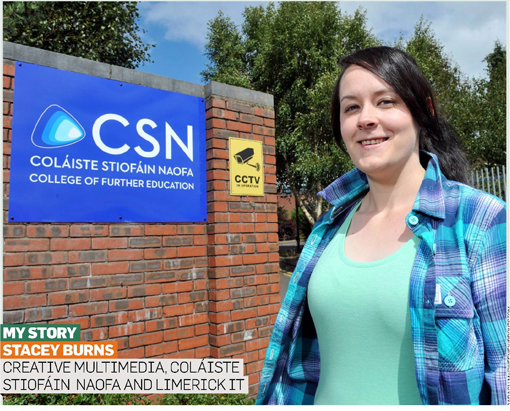 The lecturers I had to teach me at CSN were John Halpin, Andrea Halpin, Bartley Burns, and Chloe Nagle. What made these lecturers stand out educators and really approachable people was the fact they were willing to invest time and take interest in your work, which from experience not all lecturers in colleges take the time to do. This meant at times of difficulty or struggle it didn't feel like the end of the world, especially when deadlines drew near. The software we were thought to use during the course has since become invaluable to me. The same way it is invaluable to any and all digital designers. The staff at the college from the lecturers to the cleaning staff and the food staff were also very friendly and approachable leading to a comfortable atmosphere. The resources available to us in the college were more than enough to enable us to make the best of the course making for an overall very rewarding experience. I am currently 15 days from completion of a Digital Media Top up Course BA Degree and as recently as yesterday submitted my Dissertation. Upon completion of this course, I shall begin pursuit of a career in this field. so fingers crossed. I'd recommend Digital media to anybody with a creative spark and passion for design. Graphic Designer with Hopkins Communications. It is the best course I have done. I found the lectures excellent and I loved the course and what we covered over the two years. The CSN Digital Media course was amazing. Everyone who came over to Brighton (to do the University of Brighton one-year top up degree) from Cork was way more technically skilled than those who had done the first two years in Brighton. I learnt so much in those two years, what I learnt at CSN got me my degree; I wouldn't have done half as well without it.